Public service campaigns are encouraging people to eat more fruits and vegetables to maintain a healthy lifestyle. Despite years of media publicity, 85 percent of Americans are not even eating the minimum recommendation of five servings of fruits and vegetables per day. Those who do report eating some produce often fail to consume the yellow and purple colored plants that are critical components of such a program. The Life Extension Mix has been reformulated to include higher potency extracts and new, updated ingredients. “Next Generation” Chromium.- Life Extension Mix now contains a superior and biologically active trivalent chromium complex, a unique food form bio-organic water soluble matrix. It has shown to reduce blood-glucose levels by 33% compared to control. Chromium helps insulin metabolize fat, turn protein into muscle, and convert sugar into energy. Higher Potency Magnesium.- Magnesium is needed for more than 300 biochemical reactions in the body. It helps maintain normal muscle and nerve function, keeps heart rhythm steady, supports a healthy immune system, and keeps bones strong. Another unique benefit is luteolin's ability to suppress excess levels of dangerous inflammatory cytokines such as interleukin-6 and interleukin 1B Life Extension Mix contains a standardized dose of 8 mg luteolin. Lutein, an extract found in spinach and collard greens, has been shown to help maintain critical pigments in the eye macula, while the carotenoid alpha-carotene has demonstrated antioxidant activity far grater than beta-carotene. Lycopene from tomatoes has shown potent effects in helping to maintain healthy DNA structure and protect against LDL oxidation. 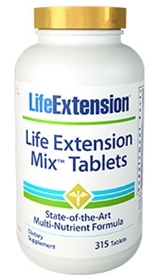 Life Extension Mix contains 60 times more lutein and 10 times more lycopene compared to Centrum. Most multivitamin supplements provide no vegetable extracts whatsoever. Olive polyphenols have been the subject of numerous studies pointing toward their benefits in many different areas, including helping to protect against LDL oxidation, suppressing free radicals, and stabilizing cell membranes. Life Extension Mix contains a potent olive juice extract standardized to contain 7 percent of the best-documented polyphenol called hydroxytyrosol. The amount of hydroxytyrosol in Life Extension Mix is equivalent to drinking one ounce of virgin olive oil per day. Life Extension Mix supplies the most powerful antioxidants, including water and fat soluble vitamin C, the ideal form of alpha vitamin E, and plant extracts that help protect against cellular DNA damage. Other ingredients in Life Extension Mix enhance beneficial DNA methylation patterns, and help maintain glycemic control and healthy levels of LDL in those already within normal range. Contains milk and soybeans. Contains yeast, corn, and sesame. This product contains NO egg, fish, peanuts, crustacean shellfish (lobster, crab, or shrimp), tree nuts, wheat, gluten, or rice. Contains NO artificial sweeteners, flavors, or colors.